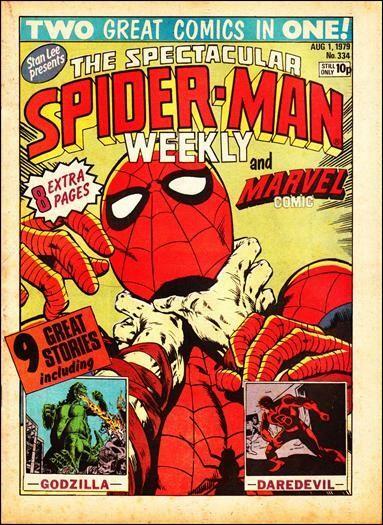 Continuing - literarily - from my MARVEL COMIC post - here's another Minor Marvel UK Landmark: the first merged issue of THE SPECTACULAR SPIDER-MAN WEEKLY (previously SPIDER-MAN COMIC) and MARVEL COMIC (334, 1 August 1979). Spidey's weekly added eight extra pages to accommodate the refugees (Godzilla and Daredevil) from the defunct successor to THE MIGHTY WORLD OF MARVEL alongside Spider-man, Thor, The Sub-Mariner, The Avengers, Thor, the Fantastic Four and Nova. The Avengers soon shuffled again, taking pole position in MC's successor MARVEL SUPERHEROES. Phew. 9 great stories? In 32 pages? It's a bit of a cheek the cover boasting 8 extra pages when the newly revamped comic still had 4 less than Super Spiderman had back in January of the same year !! As Ryan says above, cramming in so many stories was ridiculous- I thought that the 4 strips jammed into the later issues of MWOM and Super Spiderman was too much! The best way of getting more stories was the (sadly brief) Titans and Super Spiderman And The Superheroes experiment- yes the pages were half sized but I had better eyesight then and I loved the kooky "sideways" look of those comics. That was Marvel UK at it's most innovative. Just to play devil's advocate, nine strips WAS a lot but far more in keeping with the traditional British formula that Dez was trying to ape. Three pages-per-strip, per-week was about the norm. Of course, the big difference was that's probably about all an artist could produce in a week whereas M-UK only had to worry about exhausting the supply of reprints (yes STAR WARS WEEKLY, I'm looking at you). Dez's relaid pages must have been time consuming to plan and produce compared with the old US method of stripping-out the colour, adding tone and making any text and spelling changes as required. Maybe that's the real reason why the 'next generation' of weeklies post-Dez didn't bother and just cut the US strips into ever-smaller chunks.